From its beginnings in 1975, the Lake Waramaug Task Force has focused on one objective: using science and education to reverse the frightening decline in the lake's water quality. This has been accomplished through innovative thinking that has occasionally defied previously held beliefs; the seeking out of the best minds in the area of limnology; supporting the development of new technologies; and creating and sustaining awareness among those who love and enjoy the lake. Invasive plants such as Eurasian Milfoil, Curlyleaf Pondweed and Water Chestnut, as well as Zebra Mussels and some fish, have devastated nearby lakes and present an ongoing threat to Lake Waramaug. The Task Force has developed a plan for prevention, early detection and an immediate response to these threats, including the support of a program to require inspection of all motorboats being launched on the lake that may accidentally introduce invasives picked up elsewhere. 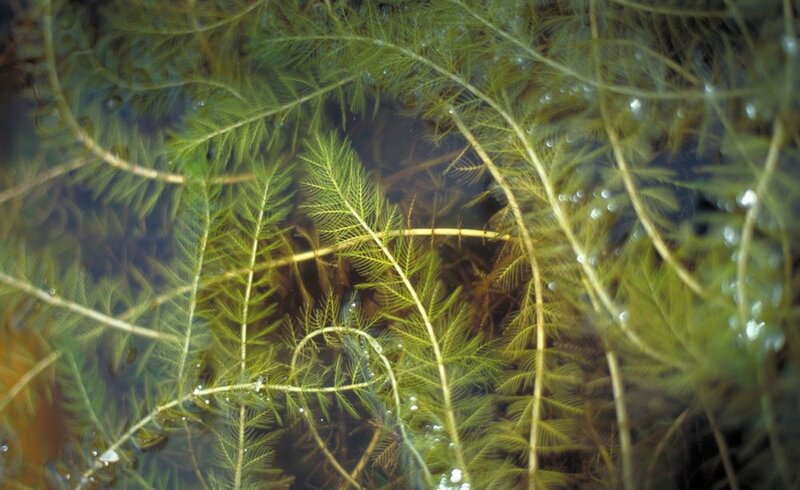 News Update: Our battle against curlyleaf pondweed — while largely successful — does continue. The State has issued an excellent identification guide to Invasive Aquatic Species. Invasive aquatic plants and other marine life present a frightening threat to Lake Waramaug's water quality. Whereas phosphorus and other nutrients are a continuing problem, our ongoing operations are able to monitor and control their effects to a large degree. Invasive Species (and there are perhaps 22 that are imminent threats) are omnipresent, unpredictable and potentially disastrous in both the short and long term. They have caused serious and chronic problems in most of the lakes in our region. With some, the discovery of symptoms indicates that we're already too late. Others, when discovered, require immediate action. The best solution is prevention. The best solution is prevention -- through education, boat inspections, and lobbying for enforcement of existing laws against the sale and transport of invasive plants. A vital backup plan is the creation of an Early Detection and Rapid Response Program with reserved funds to combat newly discovered infestations. The Lake Waramaug Task Force, Inc. The alarming algae blooms of the 1970s were, in large part, the result of a flow of nutrients, primarily phosphorus, into the lake due to the careless use and disposal of potentially harmful farm and household products. Task number one, therefore, was to educate those who lived in the watershed about these harmful effects, the availability of alternative laundry, dishwashing and other products and methods of containing waste. This was accomplished through the media, letters, posters and personal appeals. The response was overwhelmingly positive. We were off to a good start. Addressing the problems of the water already in the lake presented the most serious scientific challenge, and perhaps the most spectacular success. By the late 1960's and early 1970's, Waramaug had moved into a serious state of decline — termed "eutrophication" by lake scientists. This was evidenced by massive algae blooms being fed by phosphorus released during the summer from the anoxic (oxygen-deficient) lake bottom.To deal with this problem the Task Force's limnologist, Robert W. Kortmann, Ph.D., designed a unique "hypolimentic withdrawal" system to help contain the lake bottom phosphorus in the deep layer of the lake. Two systems were installed in 1983 — one at the tip of the Arrow Point peninsula, the other at the lake outlet in New Preston. In the following year there was a noticeable improvement in lake water clarity. The system at Arrow Point, named in memory of long-time Task Force board member Bob Frost, had the added benefit of reducing the available phosphorus in the lake by "fixing" it to the lake's abundant natural iron. 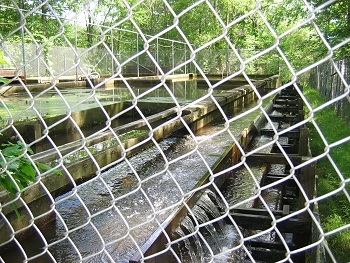 In 1989, new Kortmann-designed Layer Aeration systems were installed (see photo above) by the Task Force and suspended in deep water along the Route 45 lake shoreline. These more energy efficient systems allowed the Task Force to replace the New Preston hypolimnetic withdrawal system and greatly expanded the volume of water being circulated and aerated in the lake. In 2015, two new Layer Aeration systems were installed near Arrow Point to replace the 32-year-old land-based Hypolymnetic Withdrawal System at the Frost Site. Dr. Kortmann then conceived of a new function for this site — the potential cultivation of zooplankton. Each of these systems also benefit the lake by creating large areas of cold, well-oxygenated water habitat needed by cold water fish and zooplankton, the native natural predator of algae. Bob Frost system at Arrow Point. Installation of Layer Areation system tanks. Biofilter buffer planting off West Shore Road. The Task Force has also designed, funded and installed facilities outside of the lake but within the critical watershed area. They include waste catch-basins at a local farm and vineyard, designed to trap and filter harmful pollutants before they can flow into the lake. In addition, a biofilter was installed at an innovative buffer planting site on West Shore Road near New Preston. The Lake Waramaug watershed (i.e., the geographic area from which water eventually drains into the lake) consists of about 9,200 acres in the towns of Warren (82% of the acreage), Washington (16%) and Kent (2%). The watershed area is of vital significance to the quality of the lake's water. Housing development, the use of fertilizers by farms and in homes, commercial waste, the purchase and planting of invasive aquatic species and other activities can be seriously detrimental to the lake, even miles away from the shoreline. Consequently, Lake Waramaug Task Force initiatives have never stopped at the water's edge. They have always focused on the entire area. 3) the encouragement of voluntary and zoning restrictions on the percentage of impervious surface (i.e., driveways, walkways, etc. in addition to roof areas) of developed properties. The Task Force has also been active in encouraging the preservation of land through gifts and conservation easements. The Task Force developed programs for fish stocking (primarily brown trout) and zooplankton seeding which would be beneficial to the water quality. In one case, the Task Force reversed a long-standing practice of stocking alewives that was determined to be having adverse effects. 1600+ 10-12" Brown Trout added to the Lake in order to reduce the non-indigenous Alewife population. The Task Force also worked successfully with the towns to develop zoning regulations within the watershed which would: 1) limit building too close to the shoreline, and 2) limit the percentage of impervious surfaces in developed properties throughout the watershed. Impervious surfaces, which include driveways, walkways and athletic facilities in addition to roof areas, reduce the natural filtering effect of the soil and create harmful water runoff into the lake.